51" x 51" or 55" x 63"
What a difference a seam makes! Jelly Roll Jive wiggles and jiggles into two very different quilts simply by changing one seam. 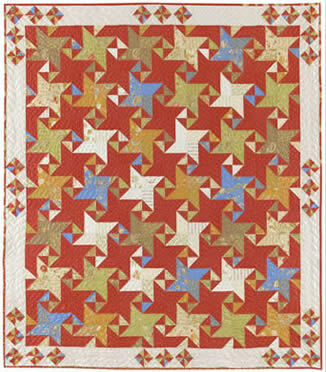 Pinwheels and Stars emerge from the background and are complimented in each quilt by a very different secondary pattern. Both quilts sparkle with a touch of pinwheels in the border. This versatile pattern can be used to create a soft baby quilt or a dynamic wall hanging.